Escape the mind-numbing effect of your workplace's last power point presentation by trekking into the field with these Power-Point loads from Winchester. The Power-Point projectile outperforms standard soft point bullets due to its intricate design: gentle jacket notches near its exposed lead point guarantee expansion at any impact distance while the soft nose itself is smartly tapered to the bullet's ogive for sleek drag-resistance and improved accuracy. During entry into a game animal, the 180-grain bullet's expansion disrupts flesh with a larger cavity, promoting faster bleeding and greater energy transfer to the vital organs. 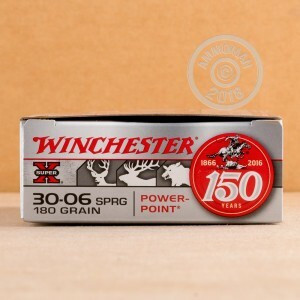 This is the power that you want on your side when testing your .30-06 Springfield rifle against massive caribous and stout mooses. 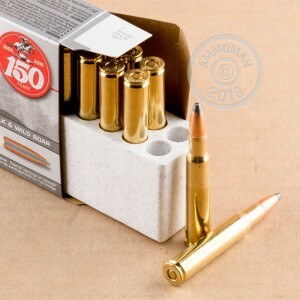 A reloadable brass casing is crimped to the bullet's toothed cannelure in order to prevent dislodgement from hurting reliable function or consistent accuracy. The cannelure also slows the bullet's expansion to allow for proper penetration and precise terminal effect. 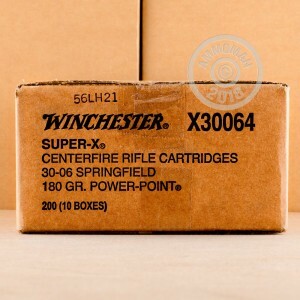 Winchester fills the casing with their own proprietary blend of high-energy propellant which is ignited by a clean-sparking Boxer primer.